I have serious problem, I bought Samsung NP-N100SP notebook I installed windows 7 and all drivers. But there is no sound from the speakers, when I put headphones I get sound. The driver (Realtek High Definition Audio) seem to be correctly installed, I reinstalled it many times, I even reinstalled windows. I suspect that its related to mono/stereo sound, because in the website(NP-N100SP) the speaker is 1.5 watts Mono Speaker (1.5 watts x 1) and in windows when its configured as stereo and i cant change it. When you play any sound via your speaker, does Windows recognize that there is a sound? To check this: Right click on the speaker icon (bottom right corner) and open "Volume Mixer" and then play some sound. If windows detects that sound do came out, you should see some movement (green bars going up and down, to match the sound). 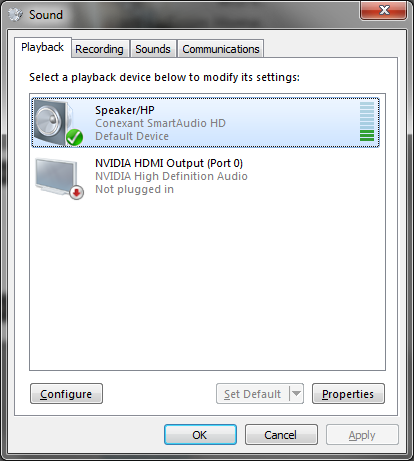 Right Click on the Speaker Icon (bottom right corner) and choose "Playback Devices"
On the "Sound" Window that appears, you should see some "Speaker" or other devices there (as picture below). Note: You may have MORE devices than the sample below. If there are other devices, or other speakers, try right clicking on them, and choose "Test" to see if that device will make a sound. If it does, then it is your speaker. And you should right click on it again, and "Set as Default Device". If you tried to test all devices shown and still no sound, most likely you have hardware issue (either broken speaker, or loose cable). the solution I got for your audio troubles is to update the audio driver... click the link for Samsung NP-N100SP Audio driver.